Today we had torrential rain to the point where you could see it coming in and blotting everything out. Then the sun followed it, and a rainbow appeared. 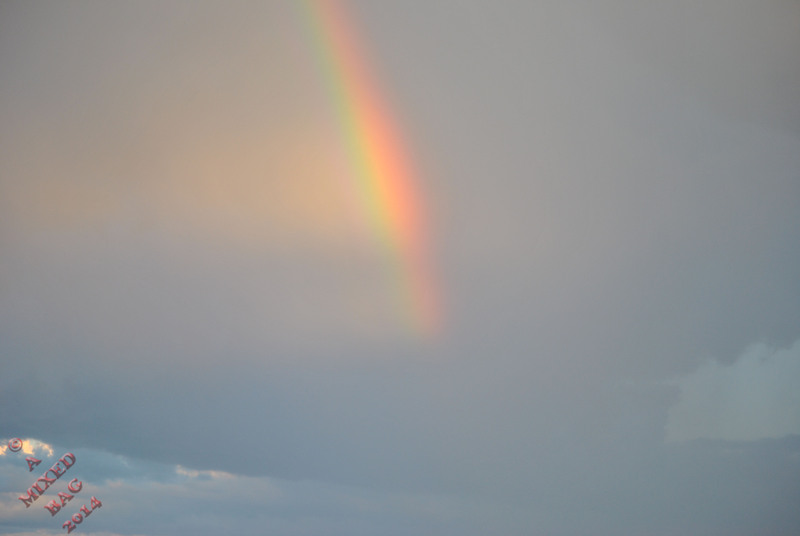 Later, the rains came back, and so did another rainbow. Two rainbows in one day. To say blessed is an understatement. There was a double rainbow, but it was not too clear, so I adjusted the colouring on one and added it again so you can see the double. This entry was posted in Photography and tagged double rainbow, Life, May, Nature, Nikon, Nikon D3000, Photos, Postaday, Rain, Rainbows, torrential rain, Weather. Bookmark the permalink. Your rainbows made me smile. 🙂 Lovely. Rainbows are always so beautifully magical! no pot of god??? now who has the accent? HA! I bet god has some good pot… HA! The joys behind the storm! I always feel privileged to spot a rainbow too ! Thanks for sharing! Hard to pick a thing in nature for me Al but rainbows are right up there ! Thanks M. They are gorgeous. Beautiful rainbow shots, Al! They always seem so magical! They do, but the camera never shows the true beauty. I know, but you did a great job! In my 54 years I think I’ve only seen two maybe three rainbows. I’m always looking when it rains and the sun comes out. Wow Al, these are so cool! Wonderful rainbows. Al! Great catches. Thanks Eric. Was amazing to see two and they were really bright. They didn’t show up well on the camera.